Feel the captivating atmosphere of ancient egypt in this new colorful solitaire from free-game-station. Com the goal is to clear the playing board. Move two cards of the same rank to the foundation. If you failed to find the pair then click on the stack to get new open cards. Be attentive while choosing the pairs, pass from one level to another perfecting your skill. Each level is harder than the previous one. Solve the mystery of the ancient egyptian civilization, discovery what majestic pyramids hide. Freeware for windows and mac os. 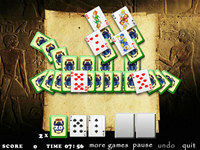 Egypt Legend Solitaire MAC is a game that works under . It is Free so you can download it and share it with your friends. Estimated download time for Egypt Legend Solitaire MAC on a common adsl connection is less than a minute. Version 1.0 was released two thousand three hundred twenty nine days ago by Free-Game-Station.com. Click the green download button to download it now.